As low as $27 for $70 Worth of Wine! Bottles Start at $9.99! Right now at Eversave you can get $70 worth of wine for as low as $27! 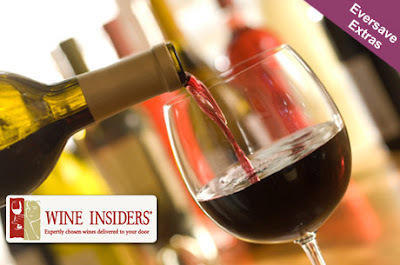 You can choose any wine you like from WineInsiders.com. With prices starting at just $9.99 for bottles, you could get a lot with your money! The deal is on sale for $29, but new Eversave members will get a $2 credit, making it just $27. You'll be able to redeem your code immediately after purchase, so no waiting around for a voucher! Important Note: Wine can only ship to the following states: AZ, CA, CO, CT, DC, FL, ID, IL, IN, IA, LA, MA, MI, MN, MO, NE, NV, NH, NJ, NM, NY, NC, ND, OH, OR, SC, TX, VA, WA, WV, WI and WY. NOTE: Shipping isn't included and starts at $9.95, unless you use your voucher towards a 12-wine assortment, then it's only 1 cent.